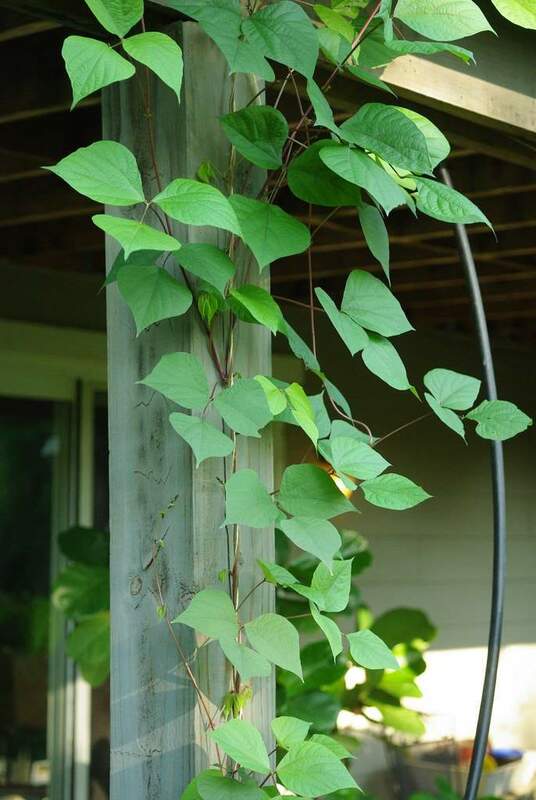 Yesterday I took a look at some volunteer vines that are starting to take over my planting beds. 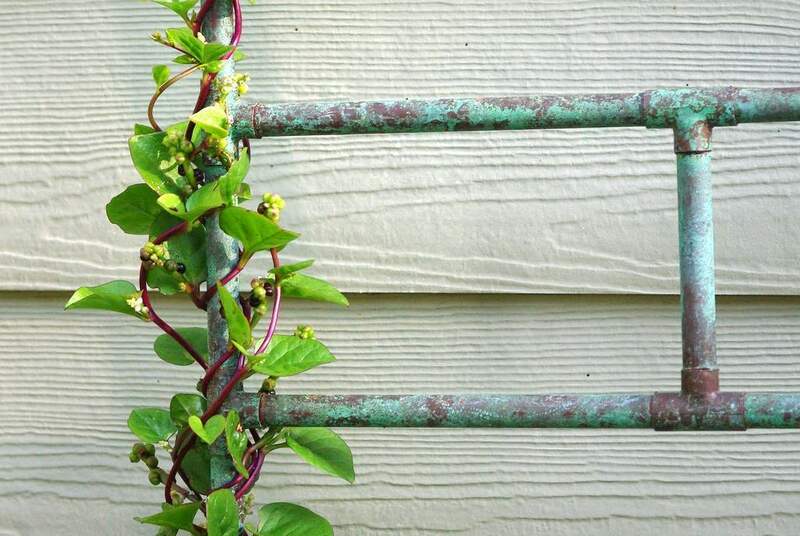 Today I want to talk about a few of the vines that I purposefully planted. 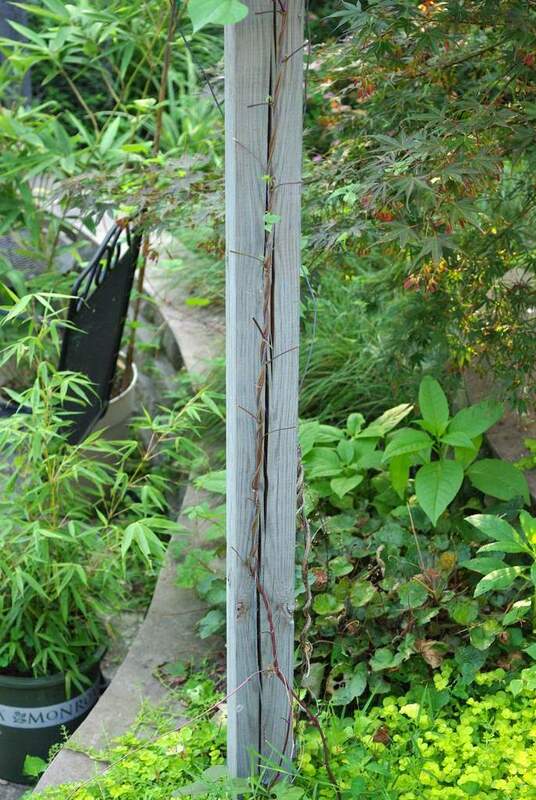 Annual vines start pretty slowly, then reach sort of a critical mass and really take off. These have just reached that point, so although they're not huge masses of foliage and flowers yet, they will be soon. 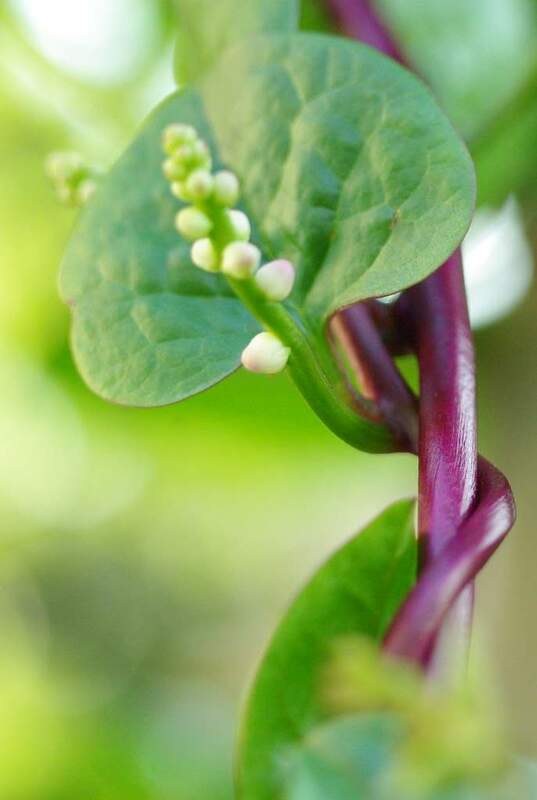 First up is a brand new plant for me this year, but quickly becoming one of my favorites: Malabar spinach (Basella alba). 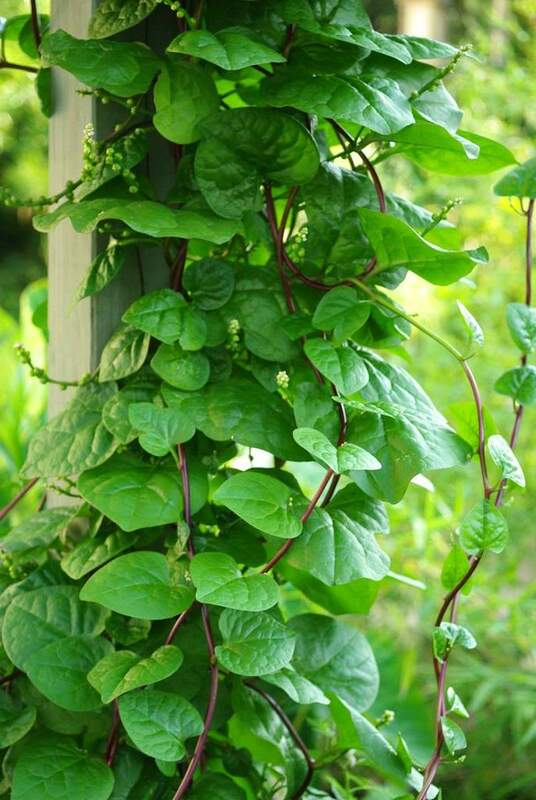 I actually bought this as a food plant for my veggie garden -- a source of greens for the hottest part of the summer when no other greens are growing. I haven't yet eaten more than a taste of a couple of leaves though, as the plants are so pretty I haven't been able to bring myself to harvest from them yet. 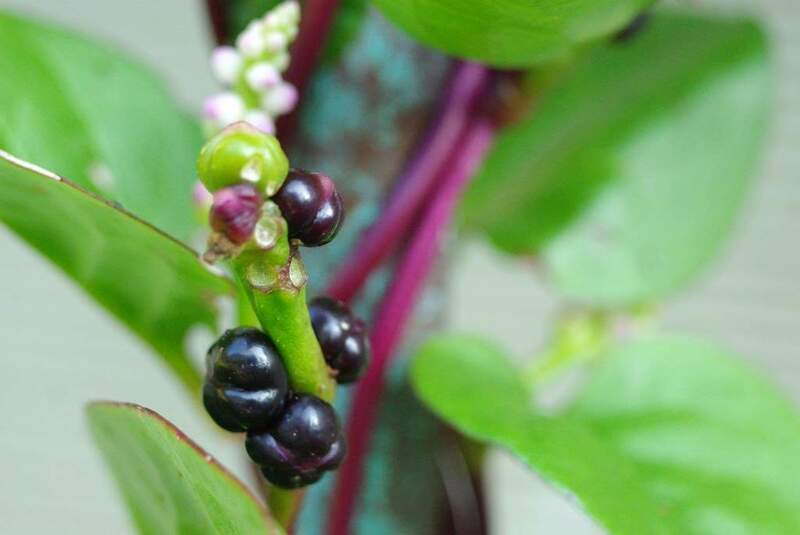 The plant is also listed as "mucilaginous", which means it gets pretty slimy in your mouth. They're not lying about that. 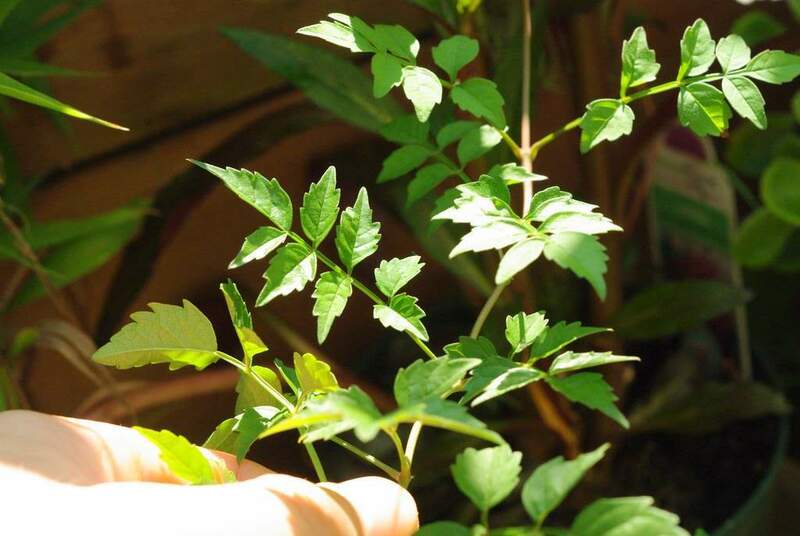 I haven't decided yet if it's strange/bad enough to keep me from ever eating these leaves fresh, or if I'll just use them in cooking -- they're often used to thicken soups. 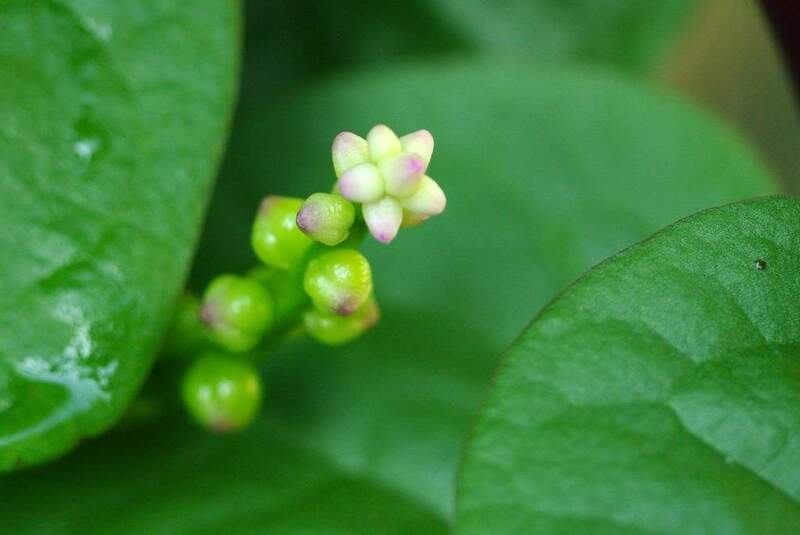 Even if I never eat a single leaf, I'll probably grow this plant every single year from now on -- I like it that much. The biggest problem with many large-leafed annual vines (some of the coolest) is that they can't take the heat, even when well-watered. 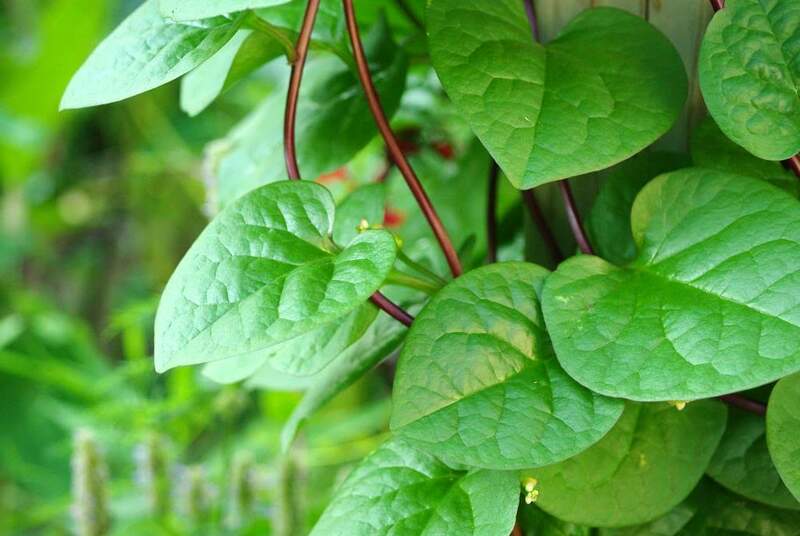 The leaves look good in the morning, then start drooping in the sunlight, and then perk back up in the evening. That's not good enough for me -- I want a plant that looks good all day long. 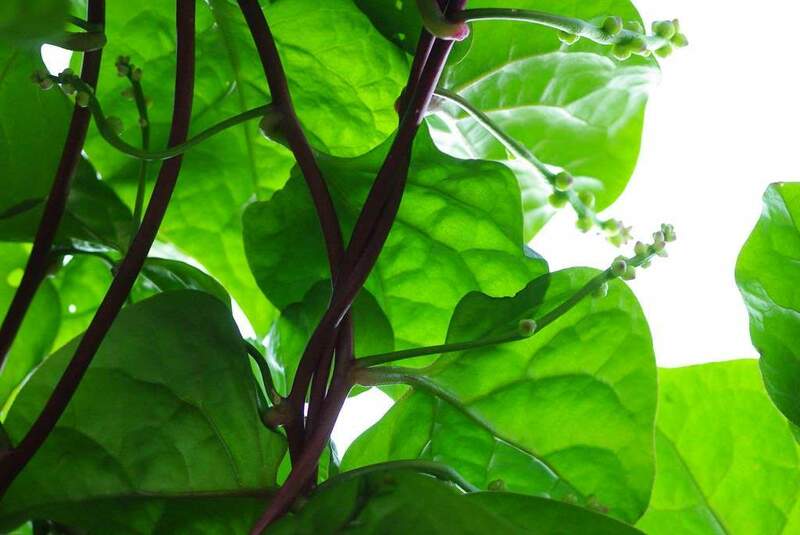 Malabar spinach appears to be impervious to heat. 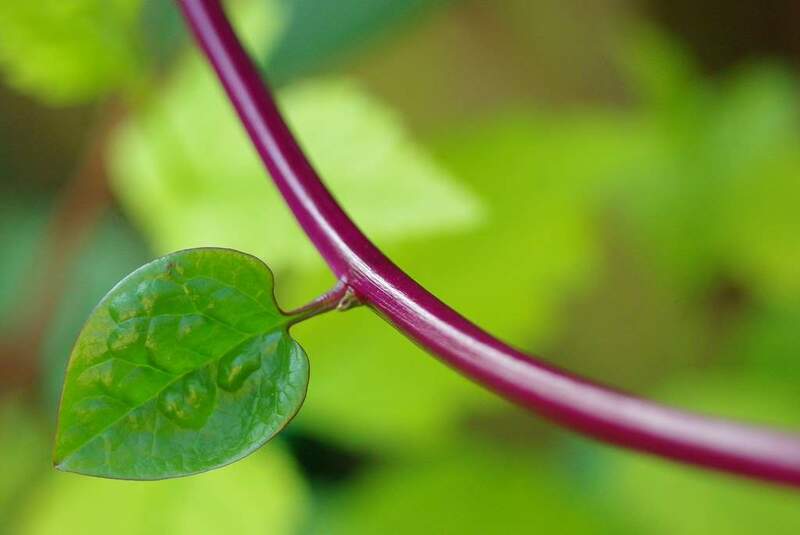 Its thick, glossy leaves look fantastic all the time, and I've never seen them droop or even have any insect damage. We haven't had any hail this summer yet, so that could be their Achilles heel, but so far they haven't revealed one. I'm really not sure what pollinates this plant, if anything. It's forming dark berries though -- I wonder if birds will eat them? 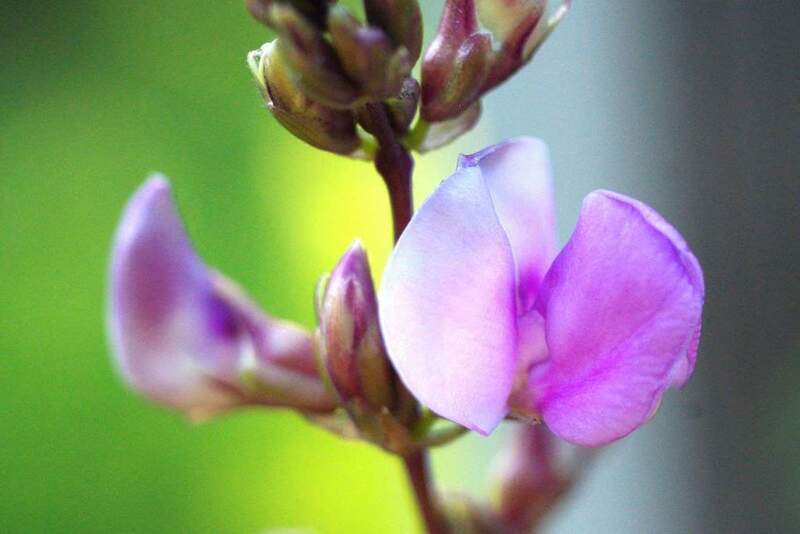 As insignificant as the flowers are, the stems are another thing in my opinion: they're fantastic! 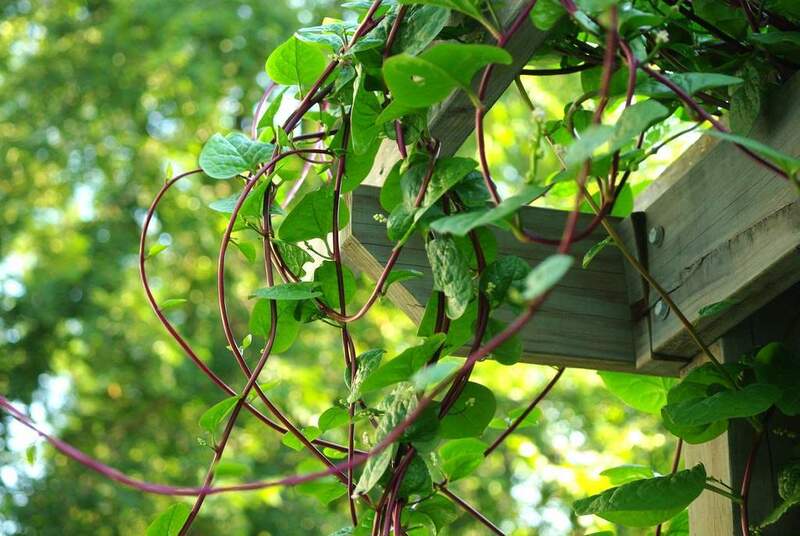 Apparently I have a thing for dark-stemmed vines, because another of my favorites is the hyacinth bean vine. I've got several of these growing in my yard (in four locations on purpose, maybe a couple of others unintended). 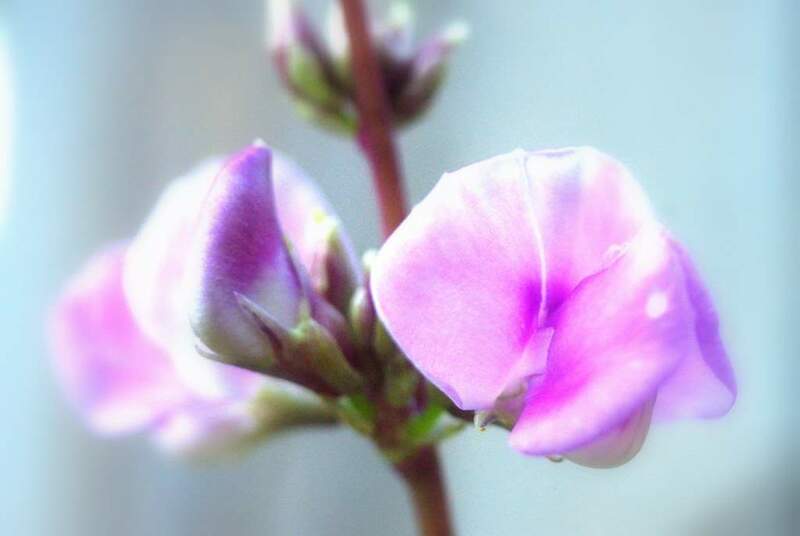 More on the hyacinth bean vine in a month or so when it becomes the star of the garden. Last up is a plant I got in a trade earlier this year: cape honeysuckle (Tecoma capensis). 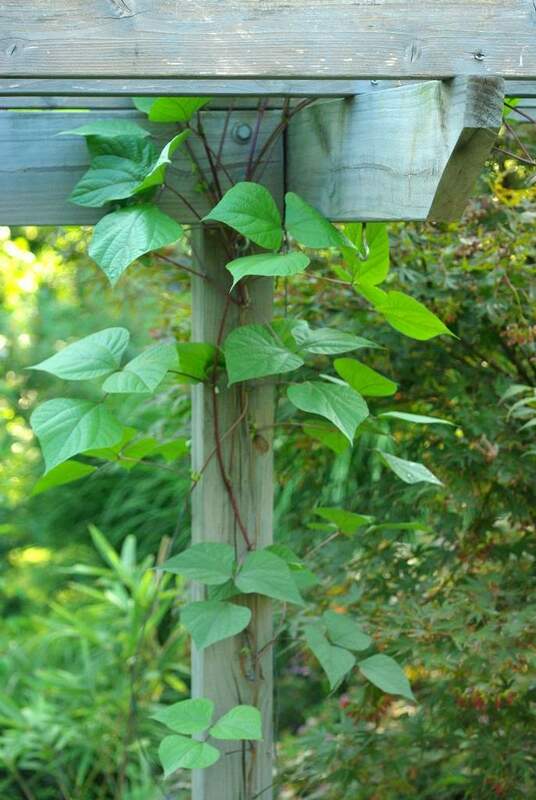 It may not be a true "vine", but it will apparently get quite tall, and that's what I want. It hasn't done much since I still have it in a smallish pot, and am still trying to find a good spot for this. I should move quickly though, since there are only about 10 weeks left in the growing season. Although this won't be cold-hardy enough to survive the winter, I was told it produces suckers quite easily so it should be easy to overwinter a part of the plant inside. 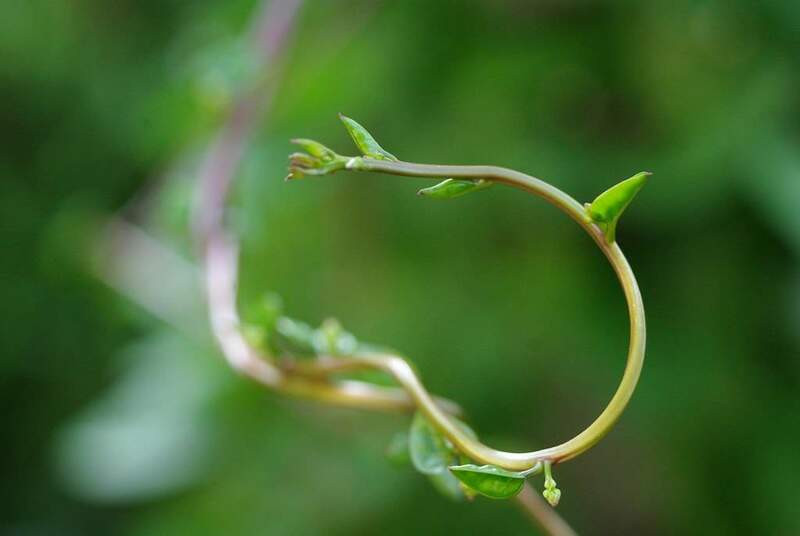 I've just confirmed this, as the longest vine tendril made contact with the ground and actually rooted in. 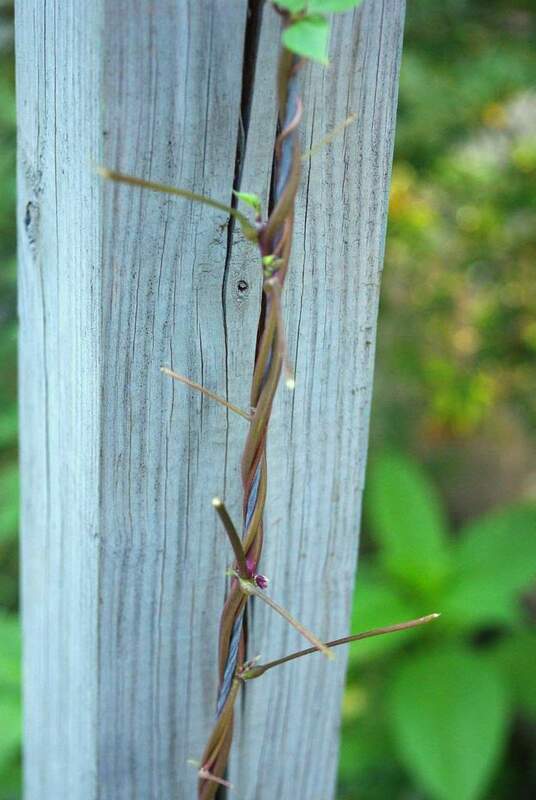 You can see that each of the "nodes" of the vine (where the leaves are) have roots forming too. I need to get this planted... maybe I'll do it early tomorrow morning when it's only 85ºF (29ºC)... like much of the country St. Louis is hot these days. Just wanted to let you know I enjoyed this post so much that I linked to it in the blog carnival (Berry Go Round) I'm hosting this month over at Beyond the Brambles!